It’s May, and the weather still refuses to catch up to the calendar. Though I’m not quite ready to break out the watermelon, my corn on the cob cravings have kicked in. Well – to be honest – I saw the season’s first cobs of corn on display at Trader Joe’s and promptly started drooling. For better or worse, I am a huge fan of corn. I say worse because as far as I know, like soy, it’s in everything we eat. 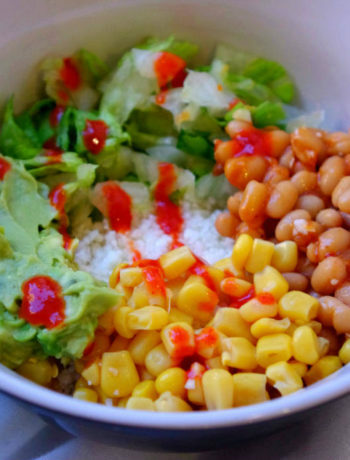 So, the fact that I seek it out in its many forms (including creamed corn – yes, I said it, and I don’t even feel embarrassed) when I’m likely already eating my fair share of corn byproducts is…very American, and probably not healthy. But I am still of the belief that vegetables are vegetables, and when you’re cooking with a whole veggie start to finish, things can’t be so bad for you. These tacos are perfect because they involve only a handful of ingredients but pack all of the flavor of something more complicated – which I’m realizing is the best part of tacos. Simplicity and flavor. These took about an hour fifteen in total, but much of that can be attributed to the roasting time. 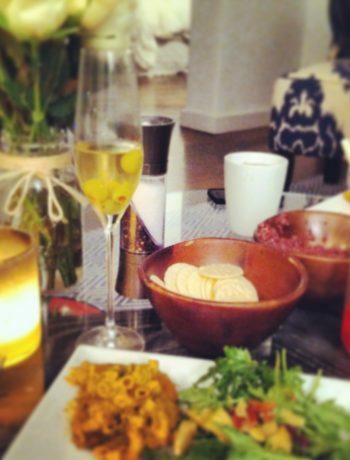 Prep is simple and fast! Preheat the oven to 400 degrees. 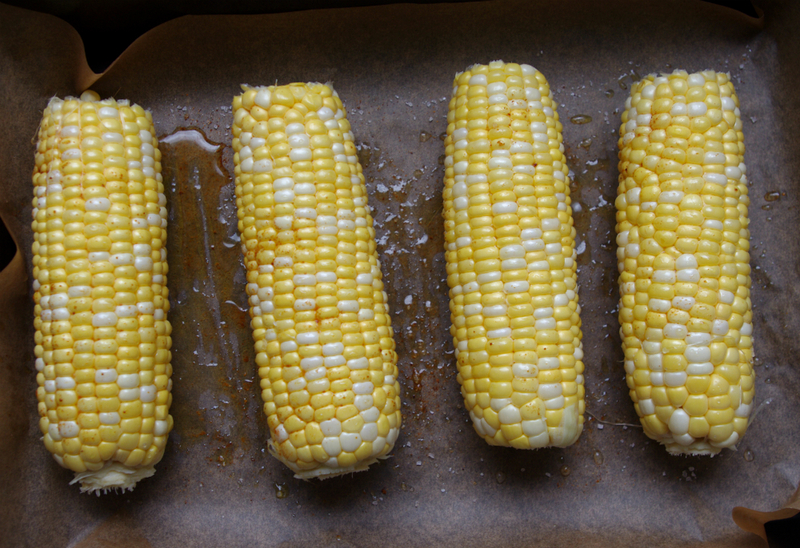 Prep the corn for roasting by lining a baking sheet with foil or parchment. Drizzle a bit of olive oil on both corn cobs (on the pan/sheet) and rotate them, sliding them around until fully coated. Sprinkle lighted with salt and cayenne pepper as desired. Roast at 400 for 30 minutes or until, when rotated, the kernels have begun to blacken a bit. 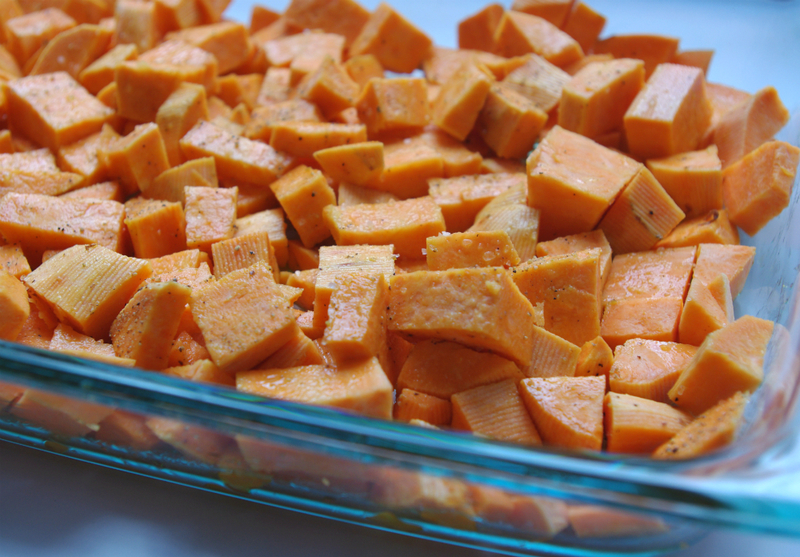 Meanwhile, prep your sweet potatoes by placing the cubes in a large bowl. Drizzle in olive oil, stir, then top with the same spices – salt and cayenne pepper. I also added black pepper. 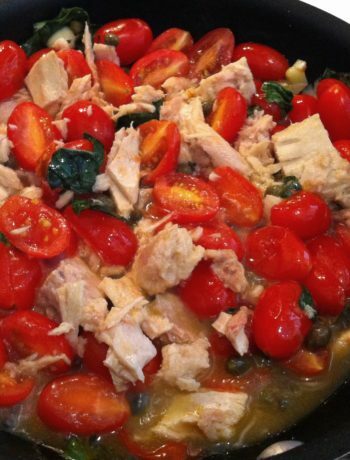 Stir evenly, then pour into another oven-safe baking sheet or use the pan from your corn once finished. 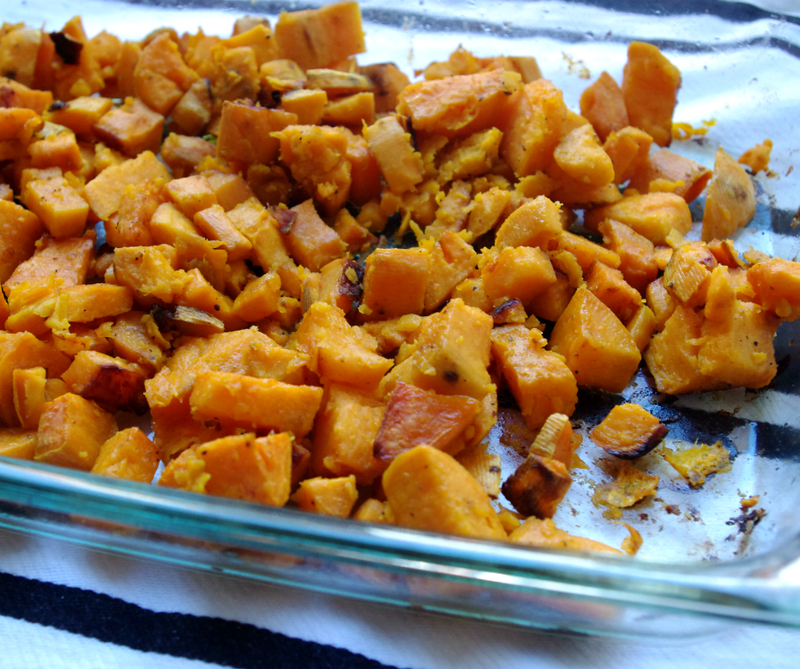 Roast the sweet potatoes for 45 – 60 minutes at 400, stirring occasionally. When the corn has cooled enough for handling, prep your slaw. Combine diced onions, black beans, and cabbage in a large bowl. Use a knife to chop off the kernels of corn into the bowl. Slice two of the limes in half and juice them into the bowl. Add a tablespoon of olive oil and salt and pepper, then stir. 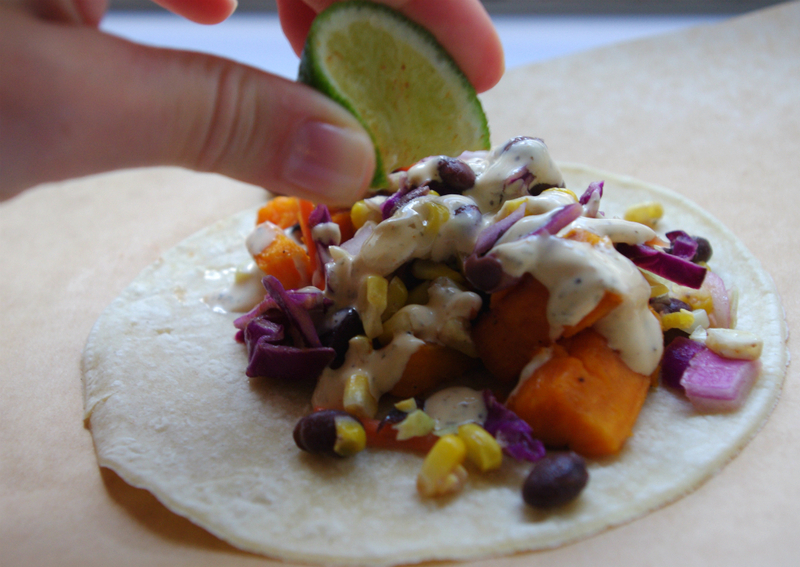 To serve your tacos, lay flat a corn tortilla. 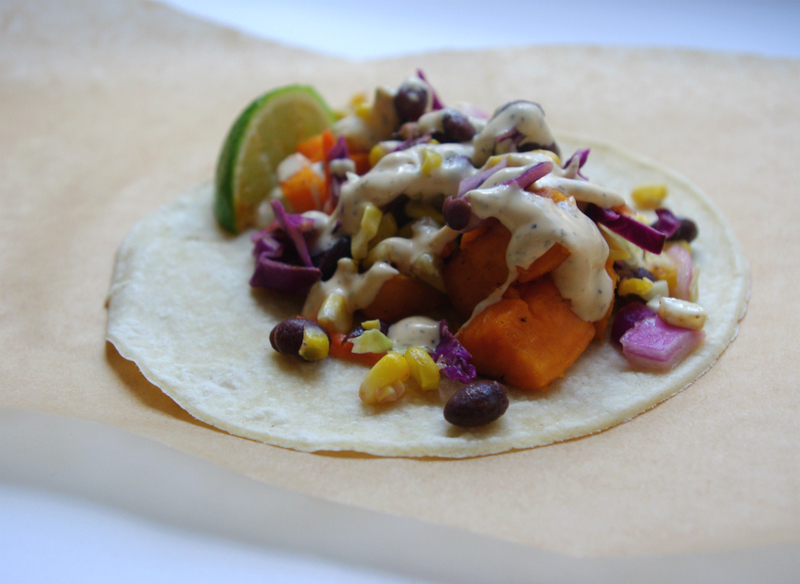 Top with roasted sweet potatoes, a few scoops of corn salad, and use your third lime for garnish and/or fresh lime juice on top. I topped my tacos with a spicy cream-based sauce – but another easy topping is either mashed or sliced avocado OR combining an avocado with some sour cream or Greek yogurt in the blender to make a green crema (as done here). 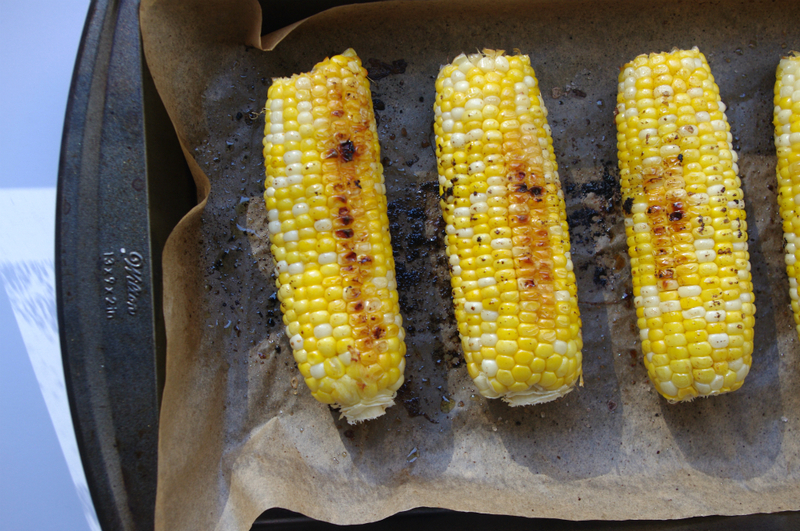 Prep the corn for roasting by lining a baking sheet with foil or parchment. Drizzle a bit of olive oil on both corn cobs (on the pan/sheet) and rotate them, sliding them around until fully coated. Sprinkle lighted with salt and cayenne pepper as desired. Meanwhile, prep your sweet potatoes by placing the cubes in a large bowl. Drizzle in olive oil, stir, then top with the same spices - salt and cayenne pepper. I also added black pepper. Stir evenly, then pour into another oven-safe baking sheet or use the pan from your corn once finished. Roast the sweet potatoes for 45 - 60 minutes at 400, stirring occasionally. When the corn has cooled enough for handling, prep your slaw. 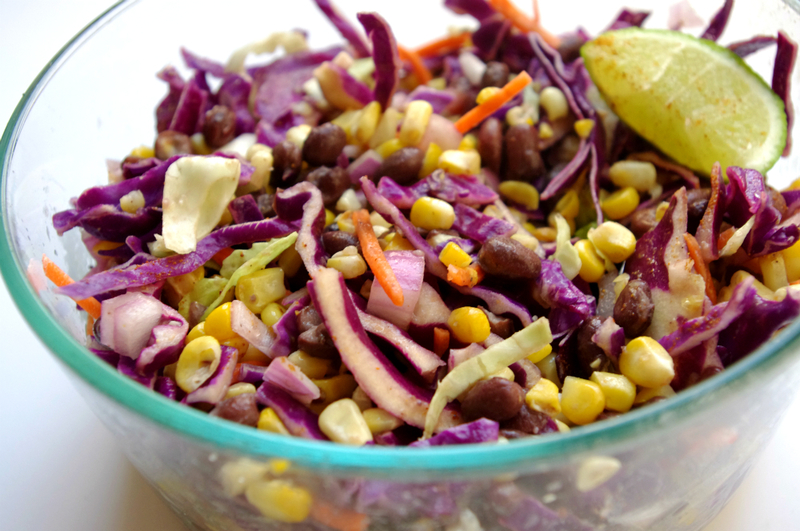 Combine diced onions, black beans, and cabbage in a large bowl. Use a knife to chop off the kernels of corn into the bowl. To serve your tacos, lay flat a corn tortilla. 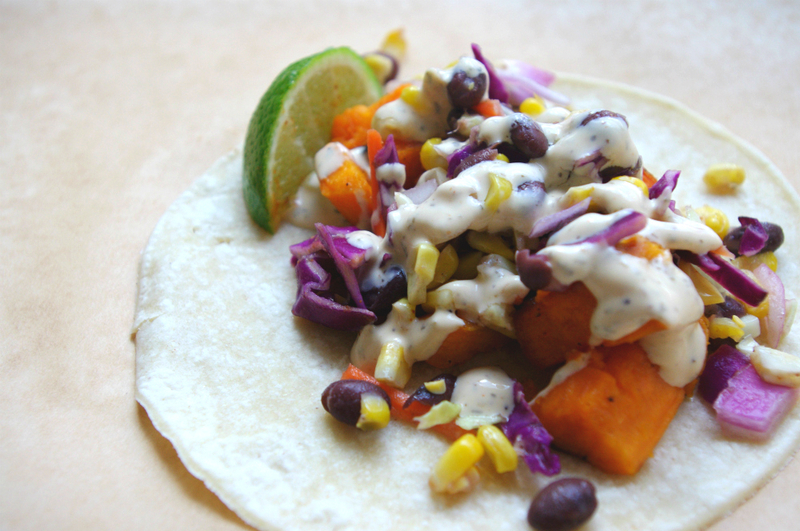 Top with roasted sweet potatoes, a few scoops of corn salad, and use your third lime for garnish and/or fresh lime juice on top. I topped my tacos with a spicy cream-based sauce - but another easy topping is either mashed or sliced avocado OR combining an avocado with some sour cream or Greek yogurt in the blender to make a green crema.